The characteristics of a flattening filter-free (FFF) beam are different from those of a beam with a flattening filter. 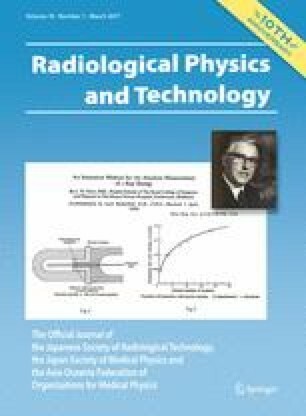 For small-field dosimetry, the beam data needed by the radiation treatment planning system (RTPS) includes the percent depth dose (PDD), off-center ratio (OCR), and output factor (OPF) for field sizes down to 3 × 3 cm2 to calculate the beam model. The purpose of this study was to evaluate the accuracy of calculations for the FFF beam by the Eclipse™ treatment planning system for field sizes smaller than 3 × 3 cm2 (2 × 2 and 1 × 1 cm2). We used 6X and 10X FFF beams by the Varian TrueBeam™ to produce. The AAA and AXB algorithms of the Eclipse were used to compare the Monte Carlo (MC) calculation and the measurements from three dosimeters, a diode detector, a PinPoint dosimeter, and EBT3 film. The PDD curves and the penumbra width in the OCR calculated by the Eclipse, measured data, and those from the MC calculations were in good agreement to within ±2.8 % and ±0.6 mm, respectively. However, the difference in the OPF values between AAA and AXB for a field size of 1 × 1 cm2 was 5.3 % for the 6X FFF beam and 7.6 % for the 10X FFF beam. Therefore, we have to confirm the small field data that is included for the RTPS commission procedures. This work won the excellent poster award at the 15th International Congress of Radiation Research (ICRR), Kyoto, Japan, May 25–29, 2015.